"Mixed feelings" title is definitely the most apposite one for this image. Beautiful iridescent clouds, Baily's beads and the diamond ring just after the third contact is surely a superb once-in-life experience. On the other hand, these stupid clouds shortened the valuable time for corona observing and caused me a lot of serious problems during images processing. The readiness of Cornelia was decisive for this image existence. 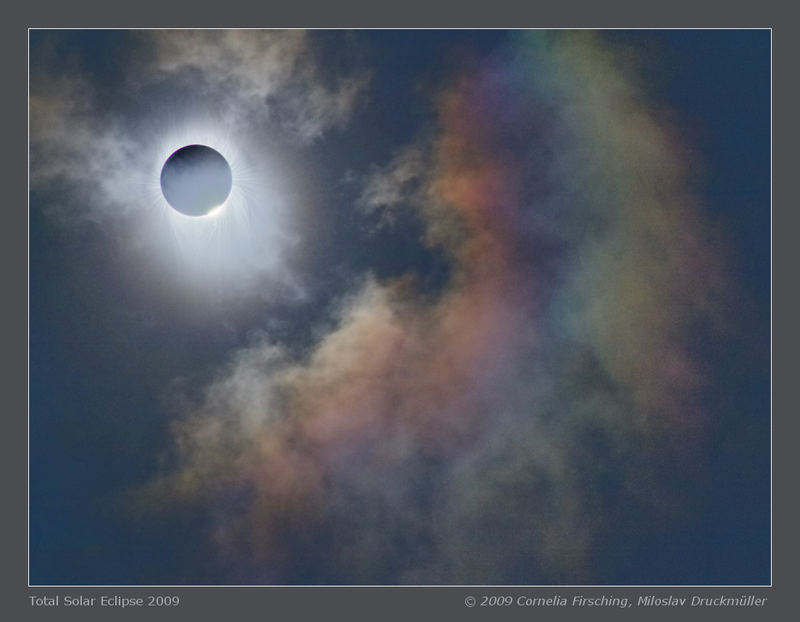 She managed to record the fleeting phenomenon using hand-held Canon EOS 50D camera. The Canon 18-200 mm zoom lens was set to 200 mm, the exposure time was 1/250, ISO 3200. This camera setting was optimal for capturing the colorful clouds but the neighborhood of the Sun was highly overexposed. That is why I used 500 mm lens images for reconstruction of the missing part of the image. I used one image taken at the same time as the iridescent cloud image which was taken with very short exposure time and other 38 image which were used for the outer corona part. The final composing procedure enabled me to preserve the clouds as they were visible about 2 seconds after the third contact. The image is very near to what I have in my mind. Iridescent clouds are a diffraction phenomenon caused by small water droplets. Iridescence has different nature from the rainbow, which is a refraction phenomenon cased by larger raindrops. Click on the image or on the following reference to display the higher resolution image version (1000 KB, PNG format). Orientation The image has identical orientation as the eclipse was visible in the sky.